Apocryphal writings ascribed to Ezra. I Esdras: Name and Versions. 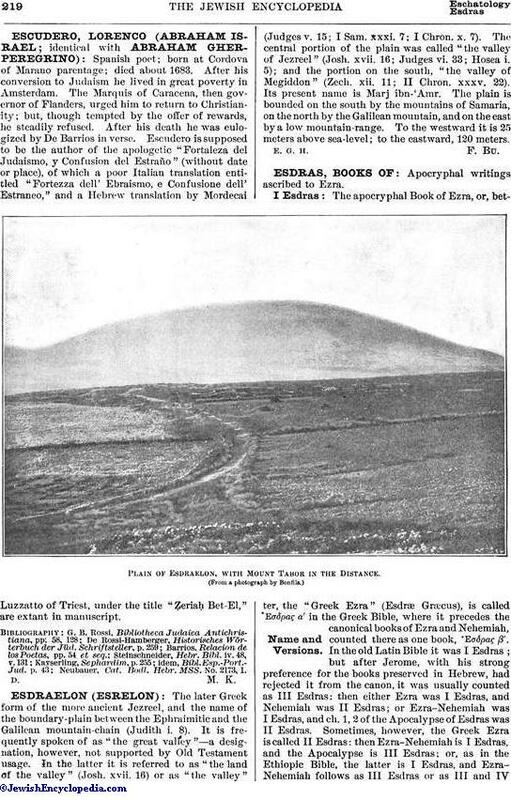 Plain of Esdraelon, with Mount Tabor in the Distance. 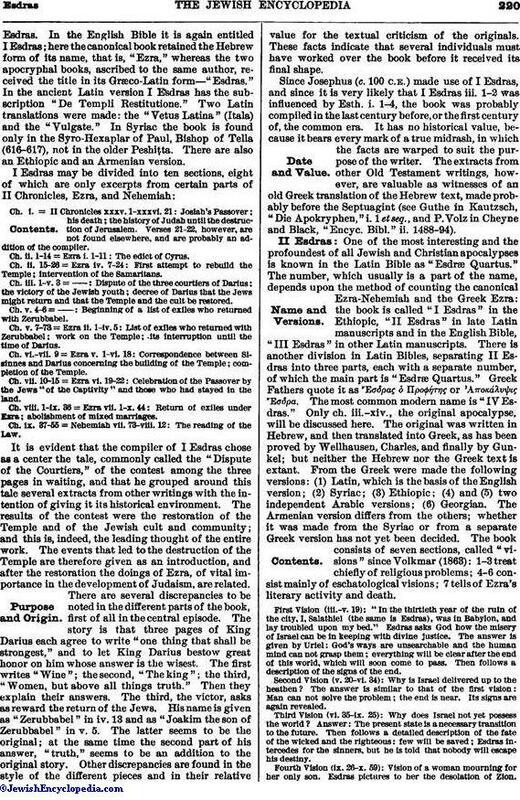 The apocryphal Book of Ezra, or, better, the "Greek Ezra" (Esdræ Græcus), is called Εσδρας in the Greek Bible, where it precedes the canonical books of Ezra and Nehemiah, counted there as one book, Εσδρας β'. In the old Latin Bible it was I Esdras; but after Jerome, with his strong preference for the books preserved in Hebrew, had rejected it from the canon, it was usually counted as III Esdras: then either Ezra was I Esdras, and Nehemiah was II Esdras; or Ezra-Nehemiah was I Esdras, and ch. 1, 2 of the Apocalypse of Esdras was II Esdras. Sometimes, however, the Greek Ezra is called II Esdras: then Ezra-Nehemiah is I Esdras, and the Apocalypse is III Esdras; or, as in the Ethiopic Bible, the latter is I Esdras, and Ezra-Nehemiah follows as III Esdras or as III and IVEsdras. In the English Bible it is again entitled I Esdras; here the canonical book retained the Hebrew form of its name, that is, "Ezra," whereas the two apocryphal books, ascribed to the same author, received the title in its Græco-Latin form—"Esdras." In the ancient Latin version I Esdras has the subscription "De Templi Restitutione." Two Latin translations were made: the "Vetus Latina" (Itala) and the "Vulgate." In Syriac the book is found only in the Syro-Hexaplar of Paul, Bishop of Tella (616-617), not in the older Peshiṭta. There are also an Ethiopic and an Armenian version. Ch. i. = II Chronicles xxxv. 1-xxxvi. 21: Josiah's Passover; his death; the history of Judah until the destruction of Jerusalem. Verses 21-22, however, are not found elsewhere, and are probably an addition of the compiler. Ch. ii. 1-14 = Ezra i. 1-11: The edict of Cyrus. Ch. ii. 15-26 = Ezra iv. 7-24: First attempt to rebuild the Temple; intervention of the Samaritans. Ch. iii. 1-v. 3 =—: Dispute of the three courtiers of Darius; the victory of the Jewish youth; decree of Darius that the Jews might return and that the Temple and the cult be restored. Ch. v. 4-6 =—: Beginning of a list of exiles who returned with Zerubbabel. Ch. v. 7-73 = Ezra ii: 1-iv. 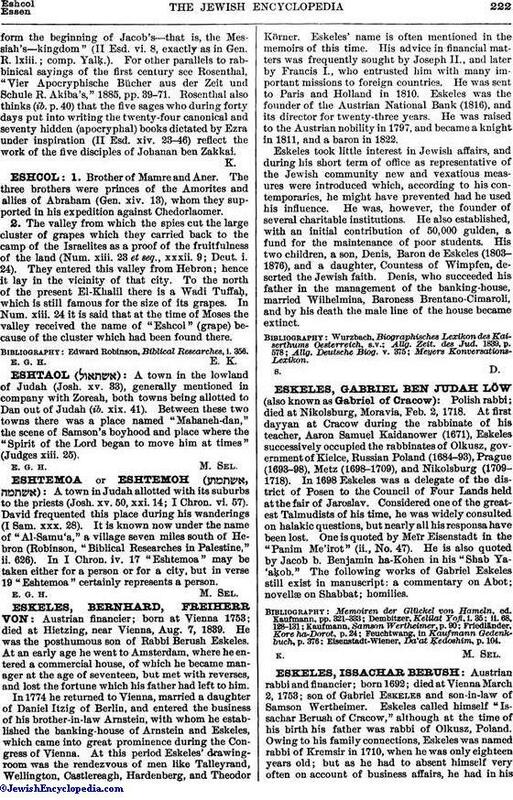 5: List of exiles who returned with Zerubbabel; work on the Temple; its interruption until the time of Darius. Ch. vi.-vii. 9 = Ezra v. 1-vi. 18: Correspondence between Sisinnes and Darius concerning the building of the Temple; completion of the Temple. Ch. vii. 10-15 = Ezra vi. 19-22: Celebration of the Passover by the Jews "of the Captivity" and those who had stayed in the land. Ch. viii. 1-ix. 36 = Ezra vii. 1-x. 44: Return of exiles under Ezra; abolishment of mixed marriages. Ch. ix. 37-55 = Nehemiah vii. 73-viii. 12: The reading of the Law. It is evident that the compiler of I Esdras chose as a center the tale, commonly called the "Dispute of the Courtiers," of the contest among the three pages in waiting, and that he grouped around this tale several extracts from other writings with the intention of giving it its historical environment. The results of the contest were the restoration of the Temple and of the Jewish cult and community; and this is, indeed, the leading thought of the entire work. The events that led to the destruction of the Temple are therefore given as an introduction, and after the restoration the doings of Ezra, of vital importance in the development of Judaism, are related. There are several discrepancies to be noted in the different parts of the book, first of all in the central episode. The story is that three pages of King Darius each agree to write "one thing that shall be strongest," and to let King Darius bestow great honor on him whose answer is the wisest. The first writes "Wine"; the second, "The king"; the third, "Women, but above all things truth." Then they explain their answers. The third, the victor, asks as reward the return of the Jews. His name is given as "Zerubbabel" in iv. 13 and as "Joakim the son of Zerubbabel" in v. 5. The latter seems to be the original; at the same time the second part of his answer, "truth," seems to be an addition to the original story. Other discrepancies are found in the style of the different pieces and in their relative value for the textual criticism of the originals. These facts indicate that several individuals must have worked over the book before it received its final shape. Since Josephus (c. 100 C.E.) made use of I Esdras, and since it is very likely that I Esdras iii. 1-2 was influenced by Esth. i. 1-4, the book was probably compiled in the last century before, or the first century of, the common era. It has no historical value, because it bears every mark of a true midrash, in which the facts are warped to suit the purpose of the writer. The extracts from other Old Testament writings, however, are valuable as witnesses of an old Greek translation of the Hebrew text, made probably before the Septuagint (see Guthe in Kautzsch, "Die Apokryphen," i. 1 et seq., and P. Volz in Cheyne and Black, "Encyc. Bibl." ii. 1488-94). II Esdras: Name and Versions. One of the most interesting and the profoundest of all Jewish and Christian apocalypses is known in the Latin Bible as "Esdræ Quartus." The number, which usually is a part of the name, depends upon the method of counting the canonical Ezra-Nehemiah and the Greek Ezra: the book is called "I Esdras" in the Ethiopic, "II Esdras" in late Latin manuscripts and in the English Bible, "III Esdras" in other Latin manuscripts. There is another division in Latin Bibles, separating II Esdras into three parts, each with a separate number, of which the main part is "Esdræ Quartus." Greek Fathers quote it as Ἔσδρας Προφήτης or Αποκάλυψις Ἔαδρα. The most common modern name is "IV Esdras." Only ch. 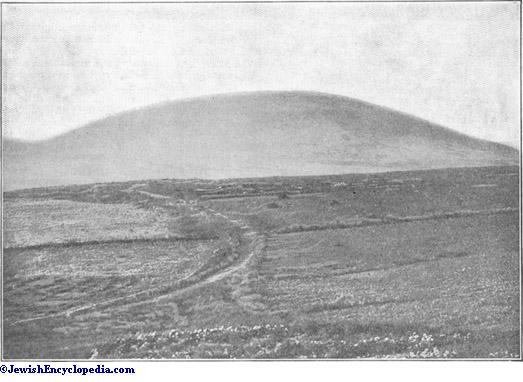 iii.-xiv., the original apocalypse, will be discussed here. The original was written in Hebrew, and then translated into Greek, as has been proved by Wellhausen, Charles, and finally by Gunkel; but neither the Hebrew nor the Greek text is extant. From the Greek were made the following versions: (1) Latin, which is the basis of the English version; (2) Syriac; (3) Ethiopic; (4) and (5) two independent Arabic versions; (6) Georgian. The Armenian version differs from the others; whether it was made from the Syriac or from a separate Greek version has not yet been decided. The book consists of seven sections, called "visions" since Volkmar (1863): 1-3 treat chiefly of religious problems; 4-6 consist mainly of eschatological visions; 7 tells of Ezra's literary activity and death. First Vision (iii.-v. 19): "In the thirtieth year of the ruin of the city, I, Salathiel (the same is Esdras), was in Babylon, and lay troubled upon my bed." Esdras asks God how the misery of Israel can be in keeping with divine justice. The answer is given by Uriel: God's ways are unsearchable and the human mind can not grasp them; everything will be clear after the end of this world, which will soon come to pass. Then follows a description of the signs of the end. Second Vision (v. 20-vi. 34): Why is Israel delivered up to the heathen? The answer is similar to that of the first vision: Man can not solve the problem; the end is near. Its signs are again revealed. Third Vision (vi. 35-ix. 25): Why does Israel not yet possess the world? Answer: The present state is a necessary transition to the future. Then follows a detailed description of the fate of the wicked and the righteous: few will be saved; Esdras intercedes for the sinners, but he is told that nobody will escape his destiny. Fourth Vision (ix. 26-x. 59): Vision of a woman mourning for her only son. Esdras pictures to her the desolation of Zion.Suddenly instead of the woman appears a "builded city." Uriel explains that the woman represents Zion. Fifth Vision (xi., xii. ): Vision of an eagle which has three heads, twelve wings, and eight smaller wings "over against them," and which is rebuked by a lion and then burned. The eagle is the fourth kingdom seen by Daniel; the lion is the Messiah. Sixth Vision (xiii. ): Vision of a man who burns the multitude assaulting him, and then calls to himself another but peaceable multitude. The man is the Messiah; the first multitude are the sinners; the second are the Lost Tribes of Israel. Seventh Vision (xiv. ): The restoration of the Scripture. Esdras, sitting under an oak, is addressed by God from a bush and told that he will soon be translated; he asks for the restoration of the Law; God commands him to procure many tablets and five scribes and to tell the people to stay away for forty days. Esdras does so, and, after having received a wondrous drink, begins to dictate. Within forty days are written ninety-four books, of which twenty-four, that is, the Hebrew canon, are to be published and seventy to be kept secret. Esdras' translation is found only in the Oriental versions; in the Latin it has been omitted, because ch. xv. and xvi. were added. The author wishes to console himself and his people in a time of great distress. He struggles with the deepest religious problems: What is the origin of suffering and evil in the world? Why does the All-Righteous create men, who He knows will suffer, or will do wrong and therefore perish? Why does man possess the mind or reason which makes him conscious of these things? Throughout these struggles the writer strives for assurance of salvation. Since this is reserved for some future era, he lays much stress on eschatology. Confidence in God's justice underlies all his thoughts. It has been questioned whether this apocalypse was written by one author. Kalisch ("Das 4te Buch Esra," Göttingen, 1889) tried to prove that it had five different sources; his views were largely adopted by De Faye and by Charles. But Gunkel rightly calls attention to the fact that the uniform character of the book forbids its reduction to several independent documents, and that its repetitions and slight discrepancies are a peculiarity of the author in dealing with his complicated problems. Closely akin to this book is the Apocalypse of Baruch; it has therefore been suggested that both might have been written by the same author. Although this can not be proved, it is at least certain that both books were composed at about the same time, and that one of them was the prototype of the other. Since the eagle in the fifth vision undoubtedly represents the Roman empire, most critics agreeing that the three heads are Vespasian, Titus, and Domitian, and since the destruction of Jerusalem so often referred to must be that by Titus in 70 C.E., the book must date from the last quarter of the first century—probably between 90 and 96. II Esdras is a characteristic example of the growth of apocalyptic literature: the misery of the present world leads to the seeking of compensation in the happiness of the future. But besides its historical value, this book is an unusually important monument of religious literature for all times. Additions: Ch. i. and ii. of the Latin and English versions are of Christian origin (probably second century), and describe the rejection of the Jews in favor of the Christians. Ch. xv. and xvi., which predict wars and rebuke sinners at length, may be Jewish; they date from the middle or the second half of the third century. idem, Der Prophet Esra, Tübingen, 1900. The author of II Esdras, also called "the prophet Ezra," in all probability, as shown by Wellhausen ("Skizzen und Vorarbeiten," vi. 248 et seq. ), had before him the Baruch Apocalypse, written under the impression of the destruction of the Temple by the Romans; he reasons more on the general problems of sin and death and on the design of God regarding the few that are saved than on the national problem of Israel's adversity and the prosperity of the heathen. In the controversy between the schools of Shammai and of Hillel as to whether, in view of the prevalence of sin and sorrow, "it is good for man to be born or not" ( ; 'Er. 13b), the author sides with the pessimistic view of the former: "It would be better if we were not born than to live in sin and suffer, not knowing why" (II Esd. iv. 12). In the same light he views the final judgment of man by God. "The germ of evil sown into man by the first sin of Adam" ( ; 'Ab. Zarah 22b) results in sin and damnation for the great majority of men—indeed, there is no man who sinneth not—and makes the human destiny far inferior to that of the animal, which needs not fear the great Judgment Day (II Esd. vii. 45 [R. V. 115] et seq. ; viii. 35). The author recognizes God's love for all His creatures (viii. 47), in spite of the fact that greater is the number of those lost than of those that are saved (ix. 15), but for him the end must be unrelenting justice and no mercy nor any intercession of saints; truth and righteousness alone must prevail (vii. 32-38 [R. V. 102-115]). Here, too, the author differs from the Hillelites, who teach that those souls whose merits and demerits are equal are saved by the mercy of God (who inclines the scale toward mercy), and sides with the Shammaites, who claim that these souls must go through the purgatory of the Gehenna fire before they are admitted into paradise (Sanh. xiii. 4; R. H. 16b). In another respect II Esdras (see iii. 30, ix. 22 et seq., xii. 34, xiii. 37 et seq.) manifests the spirit of the Shammaites in finding Messianic salvation granted only to the remnant of Israel, for it is Eliezer the Shammaite who, in opposition to the school of Hillel, denies all Gentiles a share in the world to come (Tosef., Sanh. xiii. 2). 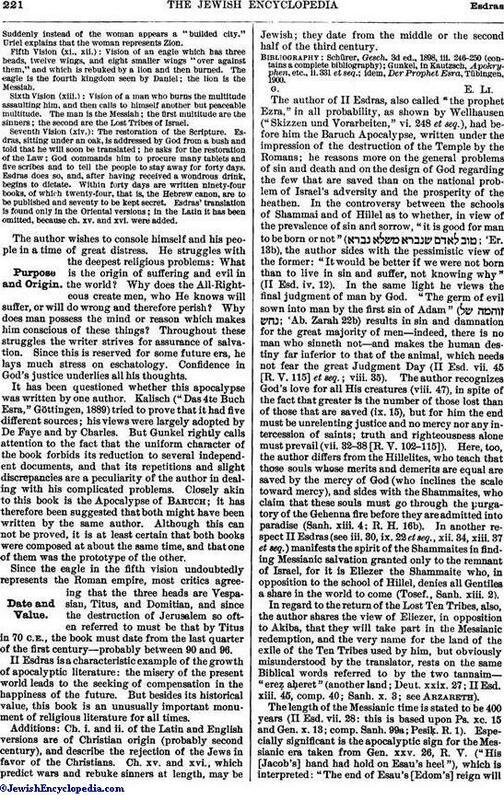 In regard to the return of the Lost Ten Tribes, also, the author shares the view of Eliezer, in opposition to Akiba, that they will take part in the Messianic redemption, and the very name for the land of the exile of the Ten Tribes used by him, but obviously misunderstood by the translator, rests on the same Biblical words referred to by the two tannaim—"ereẓ aḥeret" (another land; Deut. xxix. 27; II Esd. xiii. 45, comp. 40; Sanh. x. 3; see Arzareth). The length of the Messianic time is stated to be 400 years (II Esd. vii. 28: this is based upon Ps. xc. 15 and Gen. x. 13; comp. Sanh. 99a; Pesiḳ. R. 1). Especially significant is the apocalyptic sign for the Messianic era taken from Gen. xxv. 26, R. V. ("His [Jacob's] hand had hold on Esau's heel"), which is interpreted: "The end of Esau's [Edom's] reign, willform the beginning of Jacob's—that is, the Messiah's—kingdom" (II Esd. vi. 8, exactly as in Gen. R. lxiii. ; comp. Yalḳ.). For other parallels to rabbinical sayings of the first century see Rosenthal, "Vier Apocryphische Bücher aus der Zeit und Schule R. Akiba's," 1885, pp. 39-71. Rosenthal also thinks (ib. p. 40) that the five sages who during forty days put into writing the twenty-four canonical and seventy hidden (apocryphal) books dictated by Ezra under inspiration (II Esd. xiv. 23-46) reflect the work of the five disciples of Johanan ben Zakkai.